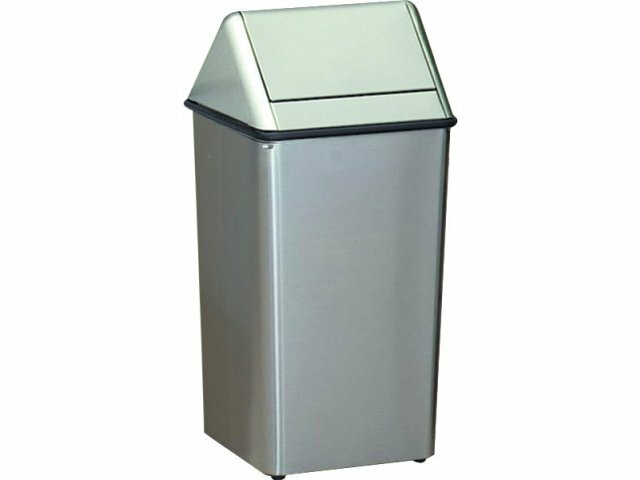 Stainless Steel Swing-Top Trash Can 36 gal. If you think that trash receptacles are a necessary evil of floor planning, it's time to reconsider. 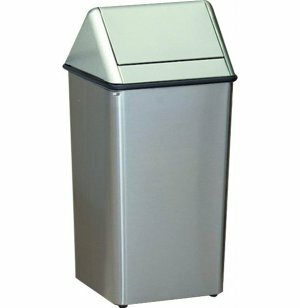 This stainless-steel trash can from Witt is not only highly durable and practical; it looks great, too. This large, hamper-style trash receptacle has a swing-top that's both attractive and user-friendly - no pedals to push or tops to lift. Its stainless-steel construction is extremely durable and stands up to the heavy, daily traffic typical of schools and businesses. The unique "flame-out" design smothers flames in seconds, eliminating concerns about smoldering cigarettes that so often get thrown into public trash cans. Fully ADA compliant, it's also suitable for companies and schools privileged to cater to those with special needs. While it may seem insignificant, the truth is that the right trash receptacle can make a big difference in the daily upkeep of your office or school. This trash can from Witt fits the bill, in more ways than one.